Take a look at Google's Zurich offices: is this your dream workplace? Just yesterday Google stock surged past $800 apiece as the company continues steady growth, but a lot about Google's success is about the people who work there. The company has long had a mission of attracting the best talent in the industry and it has set the bar extremely high providing great remuneration and benefits. It is not just about the money, though, it is also about the environment which Google knows is very important for keeping its employees happy. 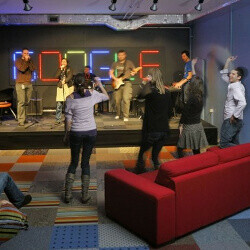 They are actually so happy Google has been voted the best place to work for once again in 2012. And with offices like the Zurich one, we can understand why. Google has been one of the first companies to pay special attention to office planning, including innovative recreational spaces and even quite rooms when one could go for a 15-minute power nap. It also serves great food made with local produce with larger seating arrangement so you can meet new people that you normally don't work with at lunch. All of those philosophies are baked in the Google Zurich office in a pretty unique way. Take a look at it below, and you might get a better understanding of why Google has been so successful attracting and keeping talent lately. Oh yeah I love it! They use Macbook not Chromebook LOL!! Yea...because they are not rabid fanboys...some of us could learn something from them. I think the exact term is patronizing your own product, not fanboyism. If a Mac book works better for you, for what you need to do....does it matter? It's not like they are running around with all Apple products. In a way....this looks bad for Apple. They constantly go after Android, disguised as going after the phone manufactures. Google has pics of their employees using Apple products. They rarely take shots at Apple. Apple looks like a spoiled brat. Get me a job at Google.... NOW! does anyone else see that almost invisible guy in number 21? i dont get that. is someone there or wat?